Back in December of last year, Nike revealed during its quarterly earnings call that it was getting ready to introduce a $350 self-lacing basketball shoe. Ever since, sneakerheads have been highly anticipating the successor to the 2016 HyperAdapt 1.0, Nike’s first consumer-grade sneaker with power laces. And now it’s finally here. Enter the Adapt BB, an auto-lacing, app-controlled basketball shoe that’s packing a ton of technology inside it. The highlight here, as you might expect, is a smart motor that automatically adjusts the lacing system to fit perfectly around your foot as soon as you put the shoe on. The Adapt BB uses Bluetooth to pair with your smartphone, and the mobile app is going to make it easy for you to save your adaptive fit settings, change the color of your LEDs and check battery life. Nike says the sneakers can last up to 14 days on a full charge, though that will depend on how much time you spend messing around with the power laces. And rest assured you wont be stuck in your sneakers if the battery dies, as Nike says they’re smart enough to save energy for loosening the laces. To charge them up, you’ll place them on a custom Qi wireless mat that Nike’s including with every pair of Adapt BBs, and it’ll take about three hours to get a full charge out of them. 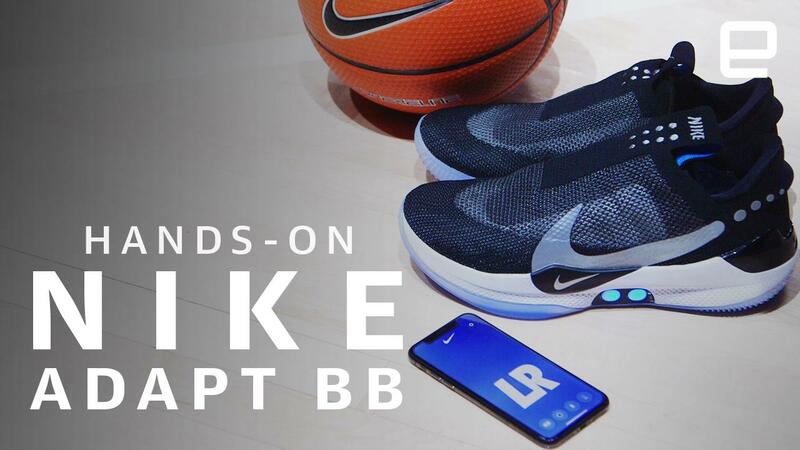 Thanks to its connected features, Nike will be able to bring new functionality to the Adapt BB over time. With Save Your Fit, for example, players can use the app to lock in their preferred settings for the power laces. In addition to that, Nike says it’s working on a way to give NBA players different tightness settings for warm-ups, and they’ll be able to opt-in to these updates to get them as they become available. Of course, you’re probably wondering, “Who is so lazy they don’t want to tie their shoes?” That’s a valid question, but what Nike is trying to do with Adapt goes beyond that. What the company wants to accomplish with the tech, dubbed FitAdapt, is offer a “truly customized fit for every basketball player.” This isn’t just about not having to tie your shoe laces — it’s about giving athletes the most comfortable shoe possible. Nike says that, over the course of a basketball game, a player’s foot can expand almost a half-size, which can affect their comfort level and ultimately have an impact on their movement and performance on the court. That’s exactly the problem Nike is looking to solve with Adapt BB. And I can tell you first-hand that when I tried on the Adapt BBs, at the launch event in New York City, I noticed how comfortable they felt as soon as I put my feet in them. I did use the app to adjust the power laces, but only slightly. It’s also nice to be able to use the buttons on the shoes themselves to tighten or loosen the fit, especially since you may not always have your phone with you during a game. One of my main gripes with the HyperAdapt 1.0 is how uncomfortable it was. The fit was so tight that I had to go for a bigger size than I usually wear, but that’s definitely not the case with the Adapt BB. The other great thing about Nike’s Adapt is how it could benefit people with disabilities, particularly those who aren’t able to tie their own shoes. It may not be the use Nike is touting for the Adapt BBs, but this has the potential to be a pleasant byproduct and the company says that’s an area it’s certainly thinking about. With the ability to update the functionality of Adapt via firmware, there’s nothing preventing Nike from rolling out specific options for that community in the future. That’s what is worth remembering about Adapt, Nike says — that its goal is to make an entire platform out of it. So, while right now we have the BB basketball shoe, the tech will soon be making its way to other sports, as well as lifestyle products. Until then, Nike’s Adapt BB is the present, and you can get a pair for yourself starting February 17th for $350 — which is a much, much better price than the $720 for the HyperAdapt 1.0s.